The regular season began poorly for Texas Stars rookie forward Scott McCulloch and ended even worse. That left him only one option this postseason -- cram all the fun of a full year into a hectic several weeks. 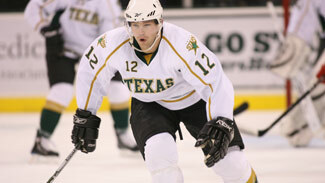 McCulloch has become a money scorer for Texas in its run to the American Hockey League Calder Cup final against Hershey. Although he has just 3 goals and 4 assists for the Stars, almost all of those points have been loaded with impact. Goal No. 1 tied Game 7 vs. Chicago in the West Division finals at 2-2. Score No. 2 was a third-period tying marker in Game 6 of the Western Conference finals against Hamilton, which the Stars won in overtime to fight off elimination. The third was a third-period winner to help Texas stun Hershey in the first game of the finals. In Game 2 of that series, McCulloch was in the middle of all the commotion again when he picked up the first assist on Travis Morin's game-winner at the 19:14 mark of the third. "The goals have come at good times for our team. That's been a positive for myself. When you get one, it makes you confident to get more," said McCulloch, 23. "I think everybody gets breaks and bounces. It's nice that they are coming in the playoffs for me." Call it evening up the score. McCulloch started the season with an abdominal injury, sending him off the ice for three weeks in October. The bad-luck bookend concluded with a concussion March 10 that ended the rest of his regular season. "It's something you deal with as you go along," he said. "Coming back and rebounding is important. Nobody wants to be sitting in the stands, especially their first year in the playoffs." McCulloch produced 5 goals and 12 assists in 50 games during the regular season, but he had a believer behind the bench. Stars coach Glen Gulutzan coached him in Las Vegas of the East Coast Hockey League at the end of last year, and saw enough to invite him to take a shot with Texas this season. Gulutzan put McCulloch in a position to exploit his energy-line role, and the player was upgraded from a tryout deal to AHL pact during the season. "That was an added bonus for me, having a familiar face around," McCulloch said. "He knows my strength, and he put me in a position to (succeed)." McCulloch remained in position to return the favor in the postseason. The Stars' series' against Hamilton and Hershey have been geographically taxing, with off-days eaten up by long travel adventures. Having a pair of relatively fresher legs to burn some pressure minutes has given Texas a boost well into June. "After six weeks (off with the concussion) you are excited about getting back in the lineup. That helped push me along," he said. "There's other guys who have played over 100 games this year. I think the time off helped. These games are so exciting. It makes it easy to get up for them." Schneider signs a new deal -- A couple of seasons ago, after returning from a disappointing stretch in Vancouver, Manitoba goalie Cory Schneider was candid in admitting he wasn't ready for the National Hockey League. The Canucks believe that his ripening process is now over. They signed him to a two-year, one-way deal last week. "I think I've gotten much better," said Schneider, the AHL's goalie of the year in 2009. "Last year, playing a lot of games helped me. For goalies, you have to be patient, take your time, earn your mark down there." There wasn't much left for Schneider to prove in Manitoba. He played in 60 games for the Moose last season, collecting a career-high 35 wins and registering 4 shutouts and a .919 save percentage. He's one of the most decorated goaltenders in Moose franchise history, with team career records for games (136), wins (83) and saves (3,520), and he's tied for the career shutout record (12). Those numbers were a testament to his talent, but the tenure also signified Schneider's distant position on the depth chart behind entrenched No. 1 Roberto Luongo. In 10 career games with the Canucks, Schneider is 2-5-1 with a 3.46 goals-against average and a .887 save percentage. "It's definitely exciting to have that reassurance (of the contact). I wasn't sure what they were thinking," he said. "But I was thrilled with the deal and the one-way. Who knows down the road what will happen? But I have a spot there now and hopefully I can keep it." Happy anniversary -- The AHL is giving its old folks the first dance at its 75th anniversary celebration in 2010-11. The league announced earlier this week that it will open on Oct. 8 with a special set of home-and-home series featuring its six most senior cities. The Hershey Bears will face the Rochester Americans, the Providence Bruins will take on the Springfield Falcons and the Lake Erie Monsters will square off against the Syracuse Crunch while wearing throwback uniforms from the earliest days of the AHL. Providence, Springfield, Cleveland and Syracuse were among the league's charter cities in 1936, with Hershey coming aboard in 1938 and Rochester hitting the ice in 1956. The Syracuse Stars were the league's inaugural Calder Cup champ. The AHL will use special logos to observe its 75th anniversary throughout the year. All team uniforms throughout the 2010-11 season will include the anniversary logo as a jersey patch and a helmet decal, and several teams during the year will wear special vintage theme jerseys celebrating the landmark birthday. League notes -- Hershey scored 12 goals and allowed 17 overall in the first period of its 18 playoff games through Game 3 of the finals. In the third period and overtime of those 18 games, it had scored 33 and allowed 17 ... For the first time since the 1992 series between Adirondack and St. John's, the road team has won each of the first three contests of the Calder Cup finals ... Hershey became the ninth team in AHL history to lose the first two games of a Calder Cup finals on home ice ... Hershey had been 37-1-0-0 in its previous 38 home games before those losses ... The gathering of 10,872 for Game 2 on June 5 at the Giant Center marked the largest home crowd in the Bears' 72-year history. It was also the tenth consecutive crowd of more than 10,000 and the ninth sellout to watch a finals game at arena since 2006 ... Ten of the last 11 Calder Cup finals have now opened with a one-goal margin in Game 1 after the Stars' 2-1 triumph against the Bears on June 3 ... The AHL took a break from its Calder Cup whirlwind to tidy up some loose business ends. It extended deals with Reebok-CCM Hockey and with and Electronic Arts ... The Rangers have agreed to terms with forward Dane Byers on a contract extension. Byers produced 25 goals and 27 assists for Hartford this year.